SPARKING STUDENT SYNAPSES WITH SCIENCE! Doing the puzzle is just the beginning! Did you know that jigsaw puzzles were first used to teach geography? Puzzles were really popular in North America in the early 1900s! Some of today’s most incredible innovations are coming from the global community of makers. Learn about the new ideas being developed every day, and find out how you can join the maker movement @ the library! Explore Game Design, Robotics, Web Design, Coding, Maker Spaces, etc.! Read all about the history of jigsaw puzzles. Click on the images above and complete the puzzles to find the stories <<correct link>> behind the pictures. 1. 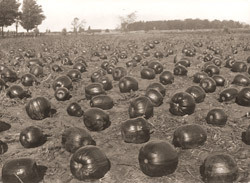 Why are the pumpkins in this picture black? 2. This picture was published in a magazine. What is the name of the magazine? What is the photograph called? Who Invented the Jigsaw Puzzle? Jigsaw puzzles were first created by an English mapmaker named John Spilsbury in the late 1760's. He glued a map of the world on a piece of wood and cut out the countries. Children would then put the pieces together to learn to identify the different countries and where they were in relation to other countries. In other words, jigsaw puzzles were invented not for entertainment, but for education. Mr. Spilsbury's puzzles taught geography. Jigsaw puzzles would be a child's learning toy until the early 20th century. 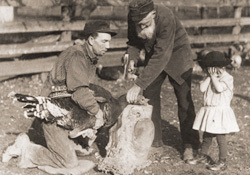 In the early 1900's, jigsaw puzzles became a form of daily amusement and activity for adults. These puzzles, however, were very expensive ($5 for a 500-piece puzzle in 1908 when a laborer earned about $50/month!). In time, the price became more and more reasonable and the popularity of puzzles continued to grow. By the time of the Great Depression in the early 1930's, 10 million puzzles were sold per week. Historians observe that the long, careful process of putting a puzzle together provided people many hours of escape from the troubles of the Depression years. Let's puzzle! Return to those early days of Mr. Spilsbury's puzzles where the purpose of a puzzle is to teach. In the late 18th century, the lesson was geography. 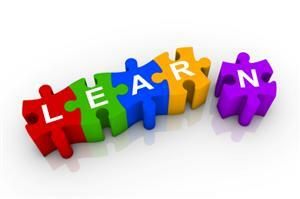 Today, educators know that the process of putting a puzzle together teaches many lessons all at once. What will students learn by putting a puzzle together? Jigsaw puzzles are a one-stop cognitive development and character-building activity. There are few educational experiences that have the potential to teach such a varied range of thinking skills, as well as other useful skills such as patience and perseverance. Here is a list of just a few of the educational outcomes when students work on puzzles both individually and together. Problem-solving strategies: Before attaching one piece to another, students will naturally determine how they can organize the pieces to simplify the task of putting the pieces together. Project management skills: Students quickly discover that success may be easier when they focus on the edge pieces first. Self-management skills: When putting a puzzle together, students will either learn on their own or be guided as to where they should work for the best results. For example, a solid table is better than a soft rug. They may also have to consider the time they have on any day to work on the puzzle. Visual skills: Puzzles help a student identify shapes and the relationships of those shapes. Puzzles teach the concept of images and mirror images and how they match together. Educators refer to the concept of Visual Literacy. As a student looks at a picture, what do the elements of the picture reveal and teach? Notice the people standing on the rock: what do they teach about the size or scale of the rock? What is the sky like? Blue and sunny, or cloudy? Was it a rainy day? What are the people wearing as they walk around the rocks? Safety ropes? What does that tell about how dangerous it is to walk on rocks in high places? Cognitive skills: Piecing a puzzle together takes planning, study of individual pieces, visualizing the whole based on pieces or parts of the whole. Character development skills and traits: Puzzles teach patience, dedication, commitment to completing a task, teamwork, group planning...the list can go on and on. Tactile skills (fine motor skills): Manipulating puzzle pieces, particularly smaller pieces, help a student develop fine motor skills. Social skills: Puzzles are fun! They involve time spent with friends, working together, talking, laughing, planning, helping one another, and celebrating the success of teamwork and accomplishment achieved together. A group that puts a puzzle together learns to communicate through verbal and non-verbal forms of communication. Collaborative skills: Social skills (above) and collaborative skills go hand in hand. The collaboration of working as a team toward a common goal prepares students for family life and work life. Puzzles teach skills and character that will benefit a person throughout a lifetime. In 1767, they were used to teach geography. Today, puzzles teach our students lessons for a lifetime. After all, it is a great benefit to be a life-long learner!